The main birthday attraction — besides the birthday girl or boy — is the cake. Birthday cakes are meant to wow and homemade birthday cakes are always the best. Enter Pinterest to bring these two facts together. 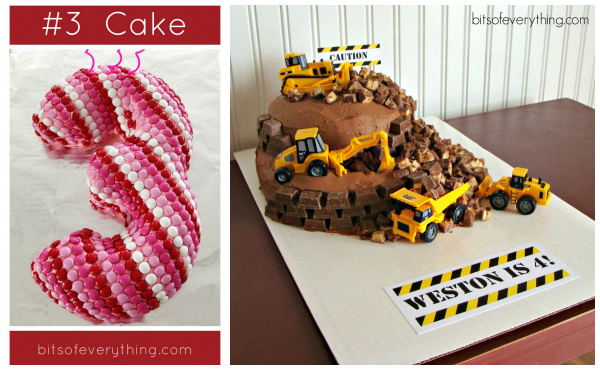 We’ve gathered the best Pinterest birthday cake ideas. Pin now, bake later. We believe in simplifying and de-stressing as much as you do. But secretly, birthdays are our exception. Birthdays are meant to celebrate and wow and unequivocally say you're special. And what better way to do all of that than with a perfect birthday cake? We say skimp on the crepe paper and bring on the baking power with one of these perfect Pinterest birthday cakes. Krissy Winnick is a wife, mother, baker, cook and the creator of Krissy's Creations food blog. Krissy's popular Pinterest birthday cake is her Strawberry Ombre Cake, a beautiful strawberry cake made out of fresh strawberries. 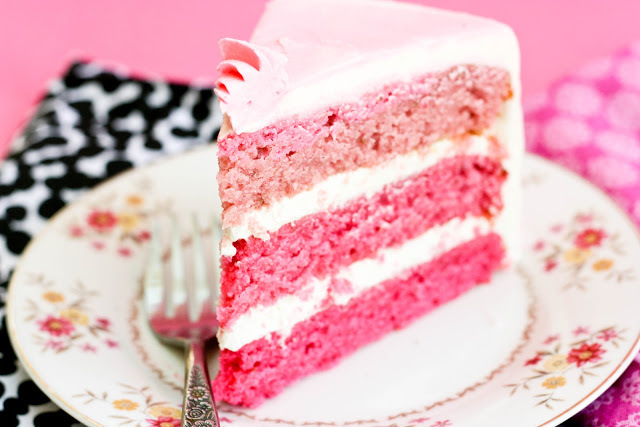 Each cake layer is dyed a different color pink to create an ombre effect. Michelle is the baker behind Sweet Dreams, a blog and app devoted to cakes, cookies, gingerbread houses and all other things that can be baked and decorated. Michelle's popular Pinterest birthday cake is her Animal Print INSIDE the Cake tutorial, a step-by-step tutorial that explains how to create zebra, tiger and leopard prints inside your cake. 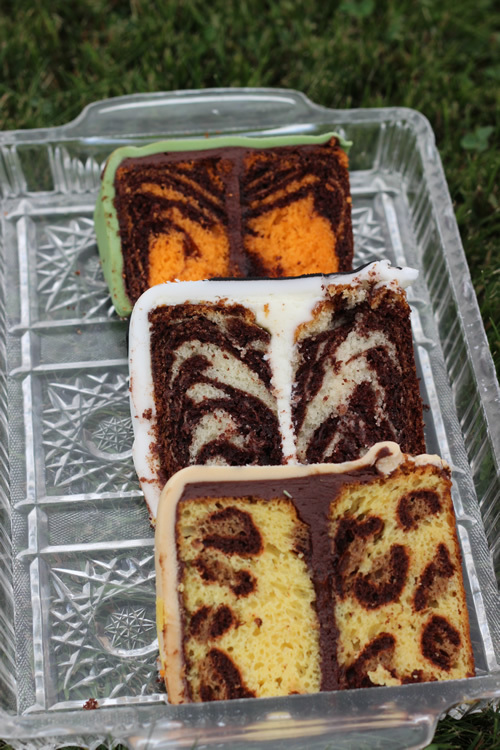 Deborah Stauch shares tutorials about her crazy baking adventures on her blog Once Upon a Pedestal. 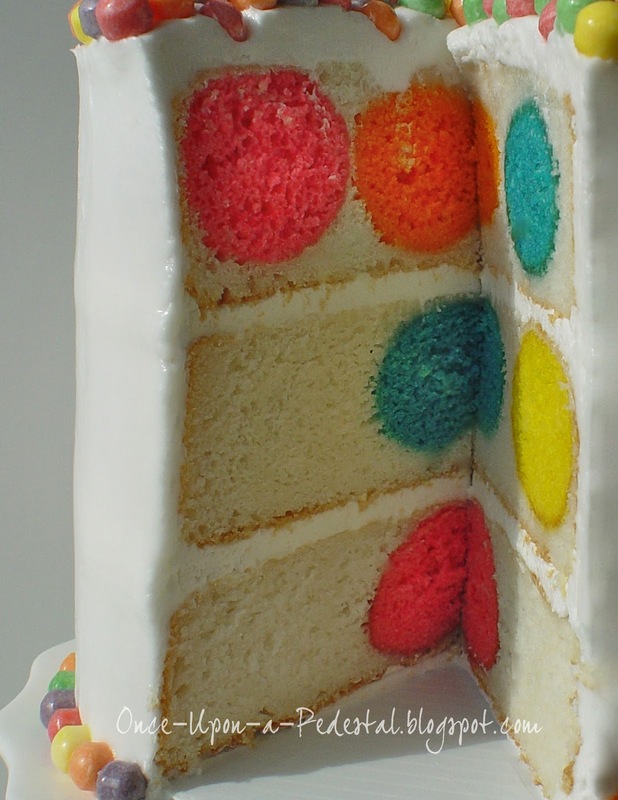 Deborah's popular Pinterest birthday cake is her Polka Dot Cake from Bake Pop Pan, an adorably creative — and totally doable — cake with hidden polka dots... on the inside. Emma blogs and bakes at CookBakeEat, a site where she shares both her passions for baking and for living a healthful life. 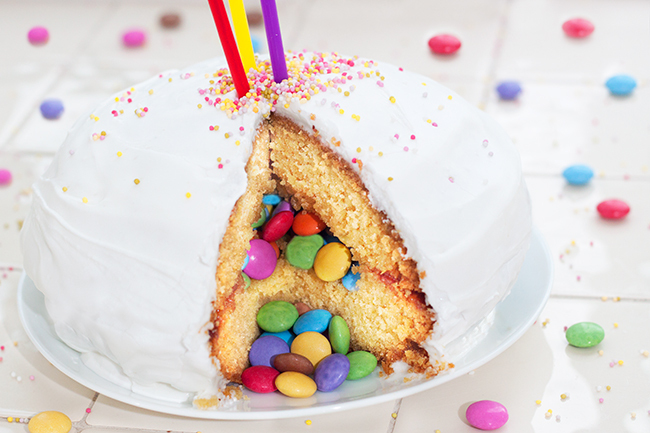 Emma's popular Pinterest birthday cake is her Smartie Pants Piñata Cake Recipe, a simple cake with a whole lot of 'wow' factor as it's hollowed out and filled with candy. Bits of Everything is a blog created by sisters Emily, Holly, Natalie, Cali and Ashlee. Between all of them, they do bits of everything: crafts, photography, cards, sewing, quilting, decorating and cooking. They have two popular Pinterest birthday cakes. The first is their #3 m&m Cake, a simpler-than-you'd-think creation that we love for its fun shape and delicious decorations. And the second is their Construction Birthday Cake, an adorably scrumptious cake that's created simply and cleverly with tools you probably already have in your kitchen. Heather Baird is the baker behind SprinkleBakes, a blog and book where she creates sweet, yummy treats with beautiful finishing touches. 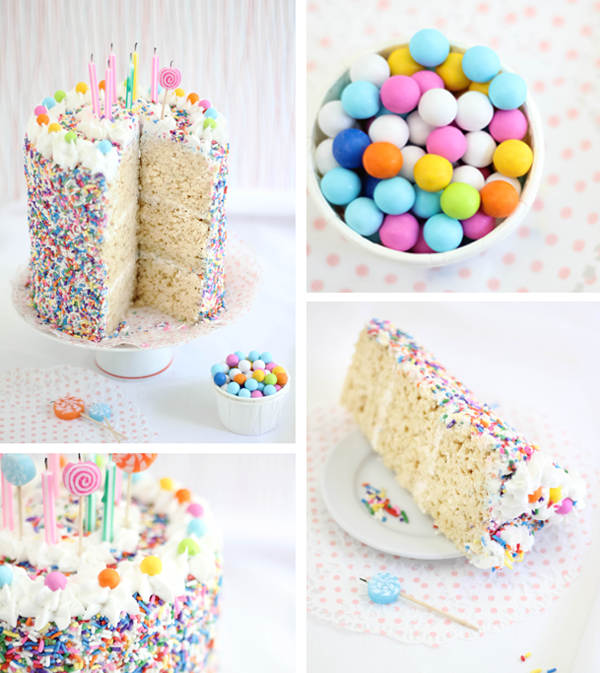 Heather's popular Pinterest birthday cake is her Rice Krispie Treat Sprinkle Cake, an easy birthday cake alternative made out of the biggest batch of everyone's favorite treat and decorated with sprinkle perfection. Shelly Jaronsky blogs and bakes at Cookies and Cups by the mantra "chronicling my life in sugar." 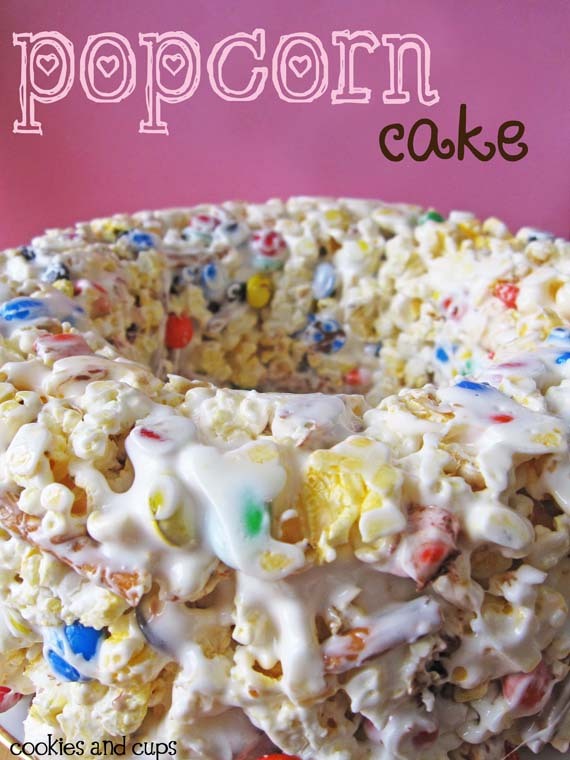 Her popular Pinterest birthday cake is a Popcorn Cake, a cake literally made out of popcorn! Actually, a cake made of buttery, salty popcorn, dotted with colorful M&M'S and salty pretzel sticks, all held together by sticky, sweet marshmallow.